You are here: Home / Blog / Products and Services / Does your bath have to be resurfaced in white? Your sanitary ware doesn’t have to be (boring) white! I offer a colour match and colour change for resurfacing and repair service. More important, thanks to own mixing scheme, I can also offer that for furniture and other surfaces that require a splash of paint. The standard option for restoring the bathroom ware is a very glossy brilliant white finish. It is, however not the limit for what you can choose for your bathtub surface colour. 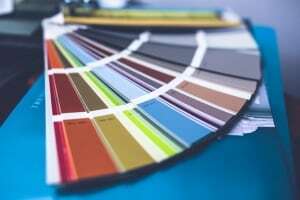 I can offer most from popular scheme’s as RAL or British Standard so whether you are a designer in a process of creation of a very special look or a lucky owner of an ocean blue toilet set, I’ll fit into the existing colour scheme and be happy to assist in your project. One of the recent projects I did was to spray 3 bathtubs in the same place, all in a different colour. 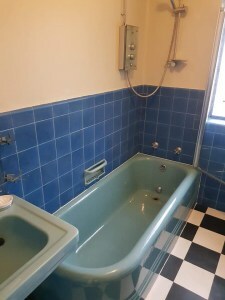 Each bathroom in a 1935 house has a different colour design and the carer of the building wanted to keep it as the original. Important is to mention, that hardly ever all the sanitary ware is in exactly same colour in a bathroom, even if it all says it’s the ‘cashmere beige’ for example. So I had to decide whether I match the soap shelf, toilet or the basin when creating the colour for the bathtub. The challenge was accomplished over two days and the results you can see on pictures to this article (below). It’s worth mention here that I was proud to do the service for National Trust on this occasion. Please contact me if your project needs more than standard white resurfacing, I can also apply a colour sanitary silicone to compliment the look of a restored unit. One of the colour matched bath resurfacing. Colour to match a soap shelf – often each sanitary piece is slightly different colour. Photo by Russ Ward on Unsplash On-site bathtub enamelling – what it is not?